Mattress Police finds Mex relaxing in the Hudson River Valley at her new (delightfully pink) Queen Anne Victorian house in the country. At the nearby summer theatre conservatory, a leading actor in a production of Once Upon A Mattress is murdered. As she investigates, Mex learns the lost secret of the four grail treasures which helps her to unravel both the case and the deeper truth about her relationship with Veronica. Seraphim Groves, the leading actress in Mattress, is the transformative agent who plays the gender slide with Mex, setting her free. Turn it over. One of my favorite Twelve Step sayings: Just turn it over. Should be simple, right? Oy, to quote Mama. This is not the same as flipping flapjacks. If it were that simple, darling, we’d all be doing it, and we aren’t. I work at it all the time, believe me. Surrender. Giving over. Letting go and letting God/dess. It’s doable. Infinitely doable. With attention. Care. Energy. Focus. Telling the truth 24/7. And good luck with that. I was standing in my back yard, lovingly known as The Park, admiring the labyrinth form, to be planted with herbs, that my contractors Lesley and Jax had just back-hoed into the ground, when the cordless phone rang. Stay awake came as I pressed Talk. That’s Spirit’s way of communicating with me. She does it frequently. The call was for my beloved Veronica, and my trusty assistant Gareth had rigged some hold button and intercom system so I could squawk to her that the call was for her. I promptly forgot the call as I gazed, rapt, at The Park. Lesley butched her way across The Park to get into her big Tonka Toy once again. The Park. It would be beautiful when it was done, and I wallowed in contentment at what my team was creating. “Baby?” wafted across the lawn to me in Veronica’s dulcet baritone. I faced her with a smile, only to be greeted by a twitchy scowl. I gave the inner voice an inner acknowledgment. Spirit is my genuine connection to the Genuine Connection. She’s a great help, when I let her help, and when I get headstrong, Goddess help me. “Honey, what is it?” I crossed to Veronica. “Maybe.” Capricorns can be cautious. Saved by the bells. Front door, telephone, and Veronica’s pager made a cacophonous chord. She jumped. We scattered in response to the ring-a-lings. We’d visit it later. Time fast approached the Summer Solstice. We relaxed more each day. I was on a Holy Grail kick in my reading. Devouring Robert de Boron, Gareth Knight and Chrétien de Troyes. Merlin had me mesmerized. I have no morals when it comes to what I read, but I do insist that I be reading and learning something at all times. So I read, and waited for calls from my decorator, deliveries from my decorator, and installers from my decorator, for the various and sundry things which transform a house into a home. I’d declined most of the cases that had been offered to me for the summer. I needed a break after the Chicago murders and the less-than-ideal denouement of my relationship with Waverley, world-famous conductor. Uh, married world-famous conductor. Yes, it was complicated. I agreed to let Gareth take on some of his very own cases and to act as consultant where necessary. You should know that I work only by referral. Mex Stone’s services are not available on the open market. Oh yes, before I forget, I ought to do the story of my name. Incredible as it may seem, Mex Stone ain’t the whole of it. Oh no. It’s Mexicali Rose Stone in full. It’s all right, I have been known to giggle about it. Sometimes. Mama, may she rest in peace, was a cabaret singer of no mean reputation. She sang the world over, and her signature song, for no satisfactory rationale known to me, was the same as my name. On the delicious autumn afternoon of my birth, she was inspired (to use the word loosely) to give me that moniker. Go figure. So, you can call me Mex. Be honest. If you were named Mexicali Rose Stone, would you let anyone use it? I thought not. There is nothing like an attentive lover to bring a hum to the heart and a blush to the cheek. Veronica Cameron D’Alcantara, after some serious soul-searching, and a break-up of two or so years, had become my Divine Right Partner again. So divine, so right that sometimes I cried. Tall, slender, deeply dedicated to her work, and her femme (that would be me), she was a gentle, loving soul, who had been down a path similar to mine. We’d both been addicts, albeit to differing substances. Addiction is addiction. It gave us an affinity, that of the bottom of the barrel. Neither of us, had we known we had a choice, would have chosen to reside there, but since we had, we understood something fundamental about one another. Veronica was unusually serene. The season at Metro Op, our name for the Metropolitan Opera where she was a production stage manager, had been a nightmare of pressure, tension, and various other forms of stress, but it was close to over. She had decided to take the whole summer off, and was intent on working in her workshop studio. On what, I didn’t know, but it didn’t much matter. I loved hearing her whistle when she was happy, and she whistled often of late. Often, come to think of it, at me. Veronica was a loyal friend and a gifted lover, and she wanted to be my husband. Watching her go through the process of figuring out what she wanted intrigued me. Originally, she’d asked me if I wanted to be someone’s wife. Lately, she’d started using the word bride instead. She asked me every day. For real. “Will you be my bride, baby?” Shivers. I got shivers every time. I still didn’t know if they were shivers of fear or shivers of anticipation, and I was having a hard time figuring it out. The word bride gave me a predictable frisson. I still hadn’t answered her. Not with words. She was happy to be with me whilst I sussed out what I wanted. She’d also told me that it didn’t matter if I were her bride in a formal way or not. She was with me, and she was staying, and that was that. You know that the nature of the physical universe is to expand, expand, expand, and then, because of the polarity in matter, to contract, contract, contract. The first contraction, if you’ll pardon the expression, had just arrived in the form of that telephone call to Veronica. I just didn’t know it then. © 1959 (Renewed) CHAPPELL & CO., INC.
Used by Permission of ALFRED MUSIC PUBLISHING CO., INC. The Mattress Police lapel pin is once again the wizardry of the ineffable Suzanne Rhodes based on an actual pin I found on www.fantasyard.com. 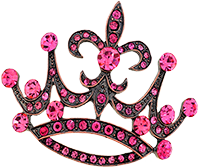 I love the fleur-de-lis. 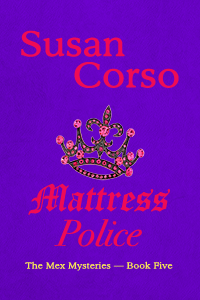 Mattress Police is a work of fiction. Names, characters, places, and incidents either are the products of the author’s imagination or are used fictitiously. Any resemblance to actual persons, living or dead, events, or locales is entirely coincidental—if you believe in that sort of thing. No part of this book may be reproduced, scanned, or distributed in any printed or electronic form without permission of the publisher. Please do notparticipate in or encourage piracy of copyright materials in violation of the author’s rights unless you know how to swashbuckle.